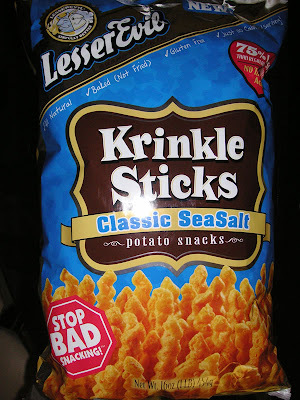 Krinkle Sticks.... dry. What did you think? Yup, very dry. Like processed sawdust. The hype on the bag definitely did not match the actual experience of eating them! Still, if you like Pringles you might like these. It's like eating Pringles in a different shape. They were doing the samples at my Costco and I was flat out grossed out. They were terrible and I was not happy because I would have never purchased them anyway. I don't know why I reached in for a sample. The price? Geeees, sometimes I shock even myself. You had a sample of those potato things? I wish they had that at the one I go to so I could have bought something else.